On the way to and from nursing classes at Borough of Manhattan Community College, I used to ride around corners on the West Side of midtown and see Fire Rescue One careening around other corners on the way to a job. In heavy Manhattan traffic, I often wound up following this large diesel truck for blocks, changing lanes and blowing a blast horn. I was riding an old BMW motorcycle. Every time it took a corner or shifted lanes, the rear door would swing out and back, like a screen door in a thunderstorm. I could see guys sitting on benches opposite each other, like they were in a swaying locker room. They'd be talking and laughing as the door slammed shut again. Over all the street noise, the air horn, and Times Square traffic, I could hear that door swing and slap, metal to metal. I wondered why they always left it unsecured. While details of my Mom's death come into and out of focus, that memory has remained clear for twenty years. I had EMS experience in different neighborhoods: Hell’s Kitchen, the Upper East Side, Harlem. But on this day in 1993, February 26th, I was a working nurse in the AIDS unit at N.Y. Downtown Hospital - Chinatown. After lunch I was sleeping on the couch in the nurses' lounge, when out of a dream came a blast horn and a "CODE!" A few confusing moments until I realized that our system was announcing a code yellow: "GAS EXPLOSION." I had never heard that one. Back on the floor I asked my manager what happened. It was the World Trade Center, where a subterranean terrorist explosion had become a mass casualty incident, (MCI). "We could get two hundred patients", still talking about a gas explosion - none of us knowing what really happened. Did anyone want to volunteer? I had MCI experience working in EMS, so I asked to go to the ER. "OK." I found someone who wanted to stay upstairs and she agreed to cover my patients on the floor. This is a small emergency room: five "curtains" and two private rooms. Today it was standing room only. The cafeteria was converted to a forty-five bed triage area - it looked like a line to cash out at Costco on Christmas Eve. Bellevue and Harlem's emergency rooms together never got this crowded. The first rescue squad to arrive at the bombed Trade Center was Truck One. 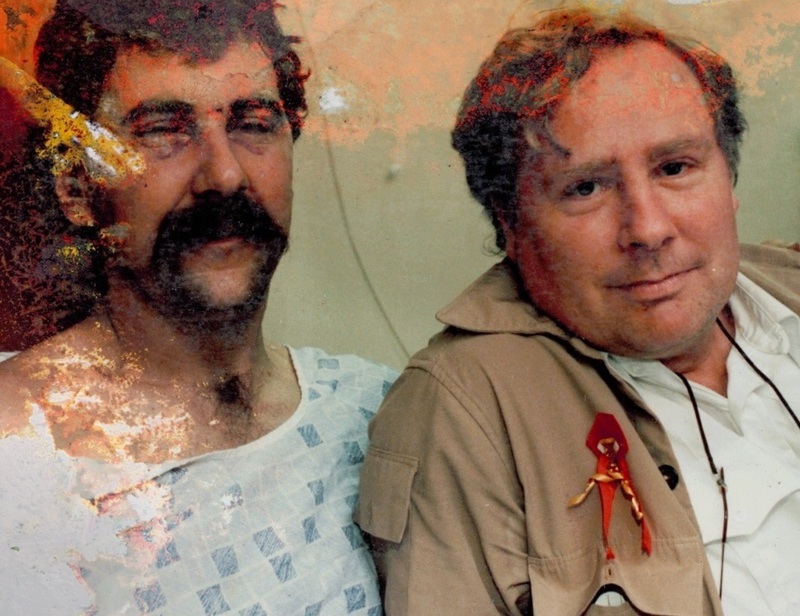 The six-story lobby atrium was filling with smoke, so the first man walking toward the fifteen-foot hole blown through the floor couldn't see it: he fell in the dark to the sub-basement where the truck bomb had been parked. He was extricated with only a fractured kneecap and some scrapes.. In the ER, I was following triage directions, doing assist jobs and vital signs. Behind "curtain number three" was a noisy group of six firemen who - though all of them were talking at the same time, seemed to be hearing each other's every word. The guy on the stretcher was laughing and holding his leg. So I met Kevin. A friendly guy hosting what sounded like a Saturday night cookout. He struck me as a fun loving kid. Later I found out he had a family and many years on his squad. These six looked a lot alike: it's been many years, but I'm sure they all had mustaches and weathered faces etched with smokers’ lines. Kevin’s eyes seemed hidden away. In the fluorescent shadows of the ER lighting, it took concentration to find them and focus in. Is there anything you need? Anticipating my next question, "No, the wife knows". This is good. We got them some waters and they were content to drink and party for the next several hours. More serious injuries were compressing the space. Six people had been killed, but none of them was brought here. The firemen were still in curtain three when I left. The wait for rooms was going well into the night or even tomorrow. Over a thousand people were injured and we were closest to the Trade Centers, about three blocks away. All rooms were occupied at that time: stretchers littered the halls, the dining room, the rehab gym. When I last saw the firefighters as a group, they were settling in for the wait: first their coats came off, followed shortly by everybody's boots, causing a stir across the ER when a multi-gallon flash flood of dirty water, mixed with black debris, spread out over the newly waxed floor, heading south through each 7 X 7 curtained cubicle. "Oh God!" , "Yuck!" Some laughter, then a "What the f**k is that?" And finally: "Well guys, at least we know which way the floor slants!" I got to meet with Kevin several times. I visited him on the floor, and through multiple stories from his visitors got to appreciate his love for his kids and the family. After he was discharged, I never saw him again..
Leaving his room after saying goodbye, I turned the corner down the hall, heading towards our AIDS wing, and ran into an awe-inspiring contingent. My thoughts flashed first to the Terminator, then to Spaghetti Westerns, Dirty Harry and Iron Man. I had to move to the right to accommodate about five "gunslingers". The leader: a tall black man in his sixties with a white mustache, wearing a shoulder-to-ankles black leather coat - reminiscent of Gestapo higher-ups. He looked dead serious and detached, evoking an image of a penitentiary warden. It would not have surprised me at all if he had stopped and said "I’ll be back!" His gait was in lockstep with four men who dwarfed him, following in their dark suits and sunglasses. Men in Black. Shoes running a "click, clack" cadence like Marines in a rush. Only upon seeing him enter Kevin's room did I realize who this was: Mayor David Dinkins of New York City. I remember thinking does this guy really walk around the city looking like this? All day? Every day? After that, whenever I found myself behind Rescue One I'd look for Kevin when that door swung open. In the first week of March it was very warm, in the fifties. Chow had the afternoon free. We took the bike down Fifth Avenue, past Central Park and the Plaza Hotel, the New York Library, the Empire State building, Madison Square. The sky was the bluest it ever gets here. We reminisced, trying to make sense of the shock and the unique vulnerable feeling we were living through for the first time. We got to the end of Fifth Avenue - Washington Square, pulled over, shut the bike down, sat down and looked south. Framed in that large arch, both Trade Center buildings shone in the reflected light from the afternoon sun. They looked new, like they did on the day Philippe Petit walked on a wire from South to North. I was living in Brooklyn, where someone in a line of stopped cars pointed at a cable between the trade centers with a small dot on it, silhouetted by the western sky. Back at Washington Square we sat, looked, tried to talk, and looked some more. Trying to put it in a box we could label - and understand. Only then could we put it away in the cellar. In the ensuing years I thought of that afternoon in the ER: the laughter, the black water, the mustaches, the brotherhood, the party Kevin brought, Chow working non-stop in the triage area. Someone told me a few years on that Kevin had transferred to Brooklyn, Rescue Two Truck. He set up a neighborhood kids' free bike fixit shop in the back room of Rescue Two’s quarters. In a neighbor's poignant memorial, Kevin came upon a tree where this man, then a young boy, was perched dangerously high as he cut an imaginary branch with an invisible saw - to keep the branch from falling on his house. As an adult he recounted the experience as a life changing event: "I remember one day for some reason I ended up in a pretty big tree." Kevin walked over, heard the boy's story and realized that this branch was growing in the boy's imagination. He helped the boy down, told him to wait and returned with a a tree-trimming tool: "If we're gonna do this, let's do it right." He explained "right tool for the right job" and the NYFD's redundant safety procedures. They then carefully cut and removed the branch. It came down like magic - no cleanup. All of this impressed the kid so much that he pestered his parents till they let him join the "juniors" at the Hewlett firehouse. "Though its been many years, I couldn't forget that small little memory we had. Today, like Kevin did, I also work as a first responder for the great City of New York." Postscript: Fourteen years later, I have two spirited, precocious eight-year-olds, Penny and Jason, and Chow and our cat, and a quiet place in Yonkers with a yard. 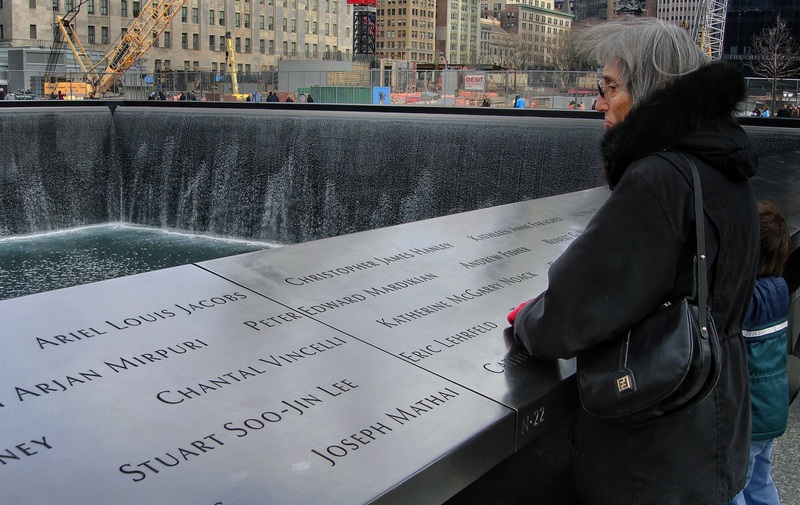 Our friend from Argentina, Silvia, whose son was killed in the North tower on September 11th, went with us to the new memorial at the World Trade Centers site. All of the names of people killed are cut in black bronze. 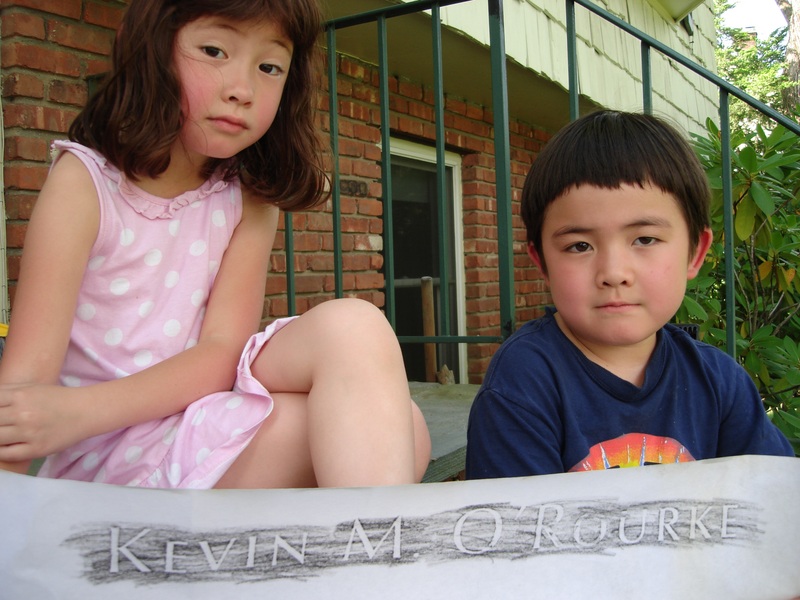 After we spent time with her son Ari, I found Kevin's name. Jason and Penny helped make a rubbing - a six-by-twenty-four-inch rolled paper rubbing. Kevin Michael O'Rourke. Chow sat with me on a stone slab, trying to take it all in, as we had on that day in March of 1993 in Washington Square. The waterfalls were one of the few sounds. Soothing and trance inducing, the water runs down the four black walls, and across the bottom to a twenty foot square hole, where it flows into the blackness. It looks like the ultimate place of no return - a black hole. We looked up at the partially finished new Trade Center, now over 90 stories; we're close enough to throw a stone and hit it. I pictured construction workers watching their sandwiches getting assembled at the world's first upwardly mobile SUBWAY, easing up floor-by-floor as the construction progresses. The sun created strange shapes reflecting off of the black glass. My eyes closed. Imagined views from the benches inside Truck One became real, along with imagined conversations - as that door swung open on Park Avenue and closed on Twenty Third. For me, it still can't be put to bed. Fourteen years. For the dead from the first attack, it's now twenty-two years. No box can hold it. When I manage to get a little of it into a folder, I can't find the file cabinet. P.P.S. After years of believing Kevin was gone, I discovered my mistake. For years I had been certain that Kevin O'Rourke was his name, and this story grew from that misbelief. I had believed that my patient from long ago was killed on September 11. Now it is clear that the man I mourned and spent hours remembering through the ensuing years, had lived through the 2001 attack and later retired. It has been an ironic shift of perceptions and loyalties and histories of one man, slowly acquired while grasping the image of another whom I mistook for him. Now, I love the stories of one I didn't know, who died that day, while holding close the moments I got to share with one I knew. who lived on. Though we have atomic clocks that can parse time into nanoseconds, we mark our personal chronology by major events–usually disasters– we’ve witnessed or experienced. “That was before the flood…” “After the fire…” and so on. In this fine memoir, time swirls, ebbs back an forth, rather than simply marching on. And through the mist come people we wish we knew, places we wish we’d been, alive and as much in the moment as they were decades ago. Excellent!